As I write this, my sweet Nana is on her deathbed. What was once a lovely, vibrant and always dignified woman, is now a tiny, shrunken creature, almost not visible beneath her bedsheets. She can no longer eat or drink on her own, and her fate, and the manner in which she will achieve it, seems especially cruel considering the fact that she loved to eat good food, and cooked and served it with gusto. She shared her passion for cooking with my mom, who in turn, shared it with me. Nana was always in the kitchen whipping up the latest cuisines for her many friends and dinner groups. Nana was the one who introduced me to fresh blueberries and real maple syrup on one of my many weekends spent with her (she is Canadian after all). I have especially fond memories of Thanksgiving and Christmas, where Mom and Nana would bustle about together in the kitchen, taking turns chopping, stirring, peeling and tasting, creating the perfect holiday feasts again and again. Each year was better than the next, it seemed. Nana was the expert at gravy, and she taught me how to make it dark and rich--never too salty or too fatty, but perfectly smooth and glossy. When I was 16, Nana gave me my first real cookbook for Christmas, The Fanny Farmer Cookbook by Marion Cunningham. In it, under the dedication it reads: Christmas 1991. To Alison- The happy cooker. Love, Nana. Happy cooker, indeed! Cooking is for me, as it was for her and my mom, a creative outlet....something that makes me extraordinarily happy, especially when those with whom I share my cooking are appreciative. Though I have hundreds more cookbooks in my collection now, I still turn to this classic often, and it has all the tell-tale signs of a much-loved and much-used book as it's pages are splattered with all kinds of goo. I know Nana would appreciate it, and Marion Cunningham too. 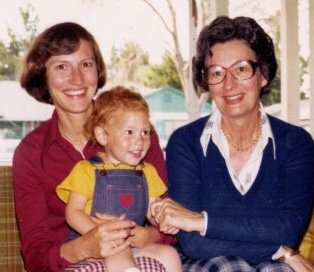 I will always remember my Nana with fondness and will never forget her kindness, gentle touch, and extraordinary patience with her four grandchildren. It is unbearably difficult to watch someone you love struggle so in her final days and hours. I can only hope that at the end of this long and arduous journey, there is a feast waiting for her--a celebration rich with other loved ones she's lost along the way and yes, plenty of food...a leg of lamb perhaps, with some of her famous gravy and maybe some mint jelly on the side. And don't forget dessert! My kids and husband have eaten hundreds of these over the years. They are crunchy, peanut buttery, and have the traditional cross-hatch marks too. Dipped in milk they make the perfect after school (or late night) snack, and they travel well in a lunch bag. They are crisp on the edges and chock-full of nuts, with the slightest bit of give in the middle. Make sure to look for shortening that has no trans-fats. 1. Preheat the oven to 350 degrees and lightly coat cookie sheets with cooking spray. 2. In the bowl of a stand mixer (or use a large bowl with a hand mixer), beat together the shortening, vanilla extract, granulated sugar, and brown sugar until light and fluffy. Beat in the eggs and stir until combined. 3. Mix in the peanut butter and beat until completely incorporated. 4. Place flour, salt and baking soda in a small bowl and whisk together. Slowly add flour mixture to the peanut butter mixture, beating after each addition, until evenly mixed. 5. Roll dough into walnut sized balls and place 2 inches apart on the prepared cookie sheets. Using a fork, make a cross-hatch design on the top, smooshing them so they are about 1/2 inch tall. 6. Bake for 8-10 minutes, or until lightly golden brown around the edges. Remove from oven and transfer to a rack until they are completely cooled. Store in an air-tight container. I had very big plans to share all the craziness of the last few weeks with you. I was going to tell you tales of the flu (all 3 kids down for over a week), of our birthday celebrations, of our holiday parties and of all the good food we've eaten. Tales of games we've played and fun we've had spending time together as a family. But then it started snowing. A lot. And where we come from, that doesn't happen very often. Or ever. So I'm very sorry to tell you that the blog will have to wait another day as we change from our perpetual summer shorts and shirtsleeves, into hats, gloves (and yes, even pants). There is sledding to be had, more snowmen to build and a garden to protect. and wish you a fantastic 2011! Click here to see all new posts. Find more of my family friendly recipes here! A Girl: that's me, although I'm not sure I qualify anymore at 34. A Market: the Farmers Market is where you will find me on Sunday mornings. Otherwise, I'll be roaming the aisles at Bristol Farms, Whole Foods, or Trader Joes. A Meal: something seasonal, something fresh, something simple, and something delicious. Click here to visit my bookstore. Alison is a recipe developer and stay-at-home mom, obsessed with her next meal and passionate about buying her food from local growers, which in Southern California shouldn't be difficult, but is harder than it sounds. Luckily, she spends summers in gorgeous Cape Cod, where farm-fresh food is as accessible as it is delicious. A Girl, A Market, A Meal by Alison Needham is licensed under a Creative Commons Attribution-Noncommercial-No Derivative Works 3.0 United States License. If you would like to post or publish any of this blog's contents including photographs, text or recipes, please ask first. I do like to share, especially when I'm given due credit! Email me with any questions at alisonlaney@aol.com. The Life of a Novice!